The Suzuki Method revolves around a concept called “the mother-tongue approach.” Dr. Shinichi Suzuki observed that every child, regardless of nationality, is able to learn and master all the complexities of their native language without ever having learned to read. He realized that for a small child to learn their language they require regular repetition, small steps, and a nurturing environment. Dr. Suzuki then went on to develop a method of teaching violin that involved small step-by-step goals, regular repetition and aural reinforcement, and a loving and positive environment. Dr. Shinichi Suzuki coined his method “Talent Education” with the idea that because each child has the ability to learn language they also hold the ability and talent to learn music. His method focuses not only on a child learning the violin, but also giving a child the gift of music which will enable them to become people capable of love and understanding. The Suzuki Method is built upon 8 key principles. Each principle is vital to the success of each child. Parent Involvement. 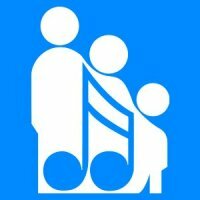 As when a child learns to talk, parents are involved in the musical education of their child. They attend lessons with the child and serve as “home teachers” during the week. The “teaching” parent must be present at all lessons for continuity and for taking notes on topics covered and the various approaches during lessons. One parent often learns to play before the child, so that s/he understands what the child is expected to do. Parents work with the teacher to create an enjoyable learning environment. Early Beginning. The early years are crucial for developing mental processes and muscle coordination. Listening to music should begin at birth; formal training may begin at age three or four, but it is never too late to begin. Listening. Children begin to learn and organize words after observing for countless hours. The early stages of the Suzuki Method work in the same way. If you and your child listen to pieces in the Suzuki repertoire on a daily basis, your child will be able to recall the pieces immediately and accurately. It is also vital for children to be exposed to quality live and recorded performances of professional musicians in order to properly develop an idea of musicality and an ear for beautiful tone. The more a child is exposed to his/her Suzuki repertoire and quality recordings, the easier it will be to reproduce such sounds. Repetition. Constant repetition is essential in learning to play an instrument. Children do not learn a word or piece of music and then discard it. They add it to their vocabulary or repertoire, gradually using it in new and more sophisticated ways. Please be sure to reinforce activities and concepts on a daily basis, or it could potentially make mastering new concepts and techniques more difficult. Encouragement. As with language, the child’s effort to learn an instrument should be met with sincere praise and encouragement. Each child learns at his/her own rate, building on small steps so that each one can be mastered in turn. Children must also be encouraged to support each other’s efforts in order to foster an attitude of generosity and cooperation. Learning with Other Children. In addition to private lessons, children participate in regular group lessons and performances through which they will learn from and be motivated by each other. The group classes provide the opportunity for each child to exchange ideas and participate in group problem-solving. Learning within a supportive group of peers also provides an environment for substantial personal growth. Graded Repertoire. Children do not practice exercises to learn to talk, but use language for its natural purpose of communication and self-expression. Pieces in the Suzuki repertoire are designed to present technical problems to be learned in the context of the music rather than through dry technical exercises. For more on the Suzuki Method and Dr. Suzuki's mission please visit the website for the Suzuki Association of the Americas, http://suzukiassociation.org.